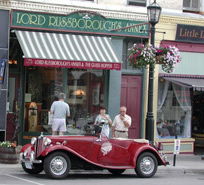 We continue to keep this tradition alive by our active participation, both past and present, in such organisations as The Royal Geographical Society, Royal Dublin Society, Irish Georgian Society, International Antiquarian Map Dealers Association, Past President of the Port Hope Branch of the Architectural Conservancy of Ontario and Founding President of the Ganaraska Regional Archives. "Our reputation is based on our integrity, friendly service, expertise and eclectic collection." Welcome. We are continually developing and changing our web site. Please call or email us for any inquiries of areas of specific interest to you and your comments on our site are always welcome.